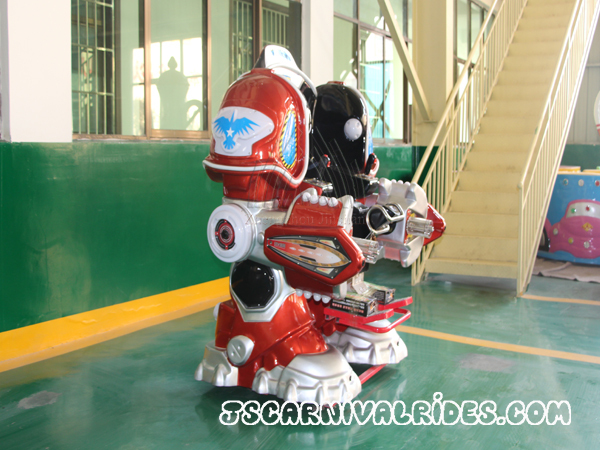 Robot walking ride is similar with Transformers. The vivid design,bright lights and special seats design make the player feel that put into with the robot and can’t refuse the attraction. It becomes a most popular design of amusement equipment. In addition , it has two handles to help the player to control the direction freely. Moving freely back and forth and rotating 360 degree on the sopt bring more funny. It have MP3 music player with the SD card socket which can change the music, and also can adjust the sound. The numerical control system, voice count function and computer counting function all can ensure accurate record. Moreover, the digital clock which have range about 1/60min can help management.